Buyers are changing the way they buy. 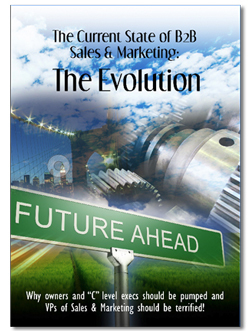 That's no newsflash, but marketing and sales departments are often just incrementing the way they approach markets. Management senses the dissonance, but silos, inertia and perspective stall required adaptation. Although business is good, there's a sense of unease among management of most B2B companies with complex sales processes. The problem is that most resources either tackle grand strategy & finance, sales methodology or marketing tactics. Amidst the profusion of all of those, John McTique and I realized there was a gap - in fact a chasm. Nothing bridged the strategy of revenue growth with the volumes of advice on how to execute. We wrote this book to do just that - to provide the Rosetta Stone of revenue growth for executives who have built largely analog careers. The changes in buying behaviors are so substantial that simply adapting existing organizational structures and resource allocation is likely to be inadequate. But with executives intent on defending the status quo, who's providing you the unfiltered advice you need to steer the company toward success? Let John and me help as we draw on our years of practical business experience and deep expertise in buying, marketing and selling in a digital world. 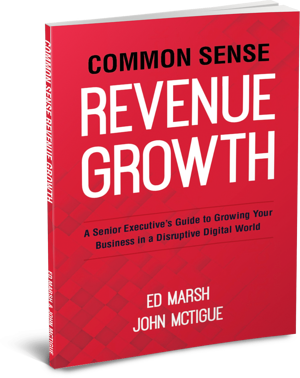 Co-written with John McTigue and published by Riptide Business Press, Common Sense Revenue Growth is an easy to read, informal and insightful dive into the murky middle ground where management will plot it's future in a new buying world. Most B2B executives sense that something is profoundly different. It's getting harder and harder to find and close deals. So most simply push harder - relying on greater frequency and intensity of traditional approaches. In case you haven't noticed....this doesn't work. The landscape has changed completely. Traditional approaches are decreasingly effective. You need to understand where we are, how we got here and how to move forward. If you're a business owner or executive (and open minded) you'll find this tremendously exciting. But here's a warning. If you're a VP of Sales and/or Marketing, you should be terrified. Your world has changed! This book is written for business owners. It's neither an academic volume, nor a typical 250 page business book. It's intended as a two hour read on the commuter rail or a short flight. And if it resonates for you, it then includes an instruction manual for how to get your business on track. Senior executives will be thrilled with the opportunities to be embraced - but traditional sales & marketing types should be terrified!